Have you ever looked a camel in the face? I mean really looked a camel in the face? 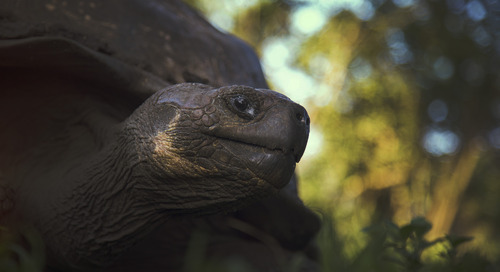 What with their long flat snouts, heavily hooded eyes, and elongated necks, they look a bit outlandish. And they always seem to be slightly baffled. Add to that spindly legs, a humped back, big feet, and an ungainly gait and, well, you have an animal worth looking at. At least to me, and presumably, the many thousands of people who show up at the annual Pushkar Camel Fair in Rajasthan, India. 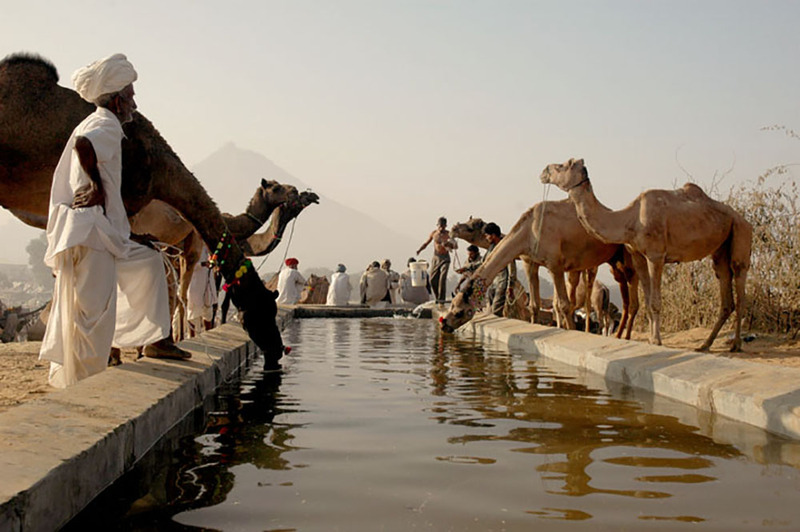 At the heart of the Pushkar Camel Fair are — you guessed it — hundreds of camels. 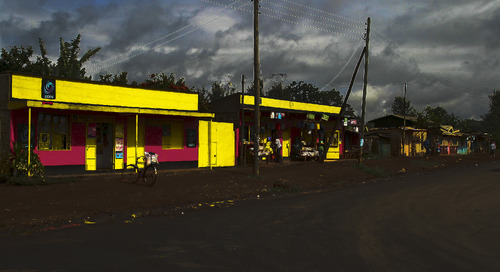 Photo courtesy of Koshy Koshy. Every year, the sacred town of Pushkar in North India swells in size to about 250,000 from about 15,000 in the days leading up to the full moon called Karthik Purnima — usually in November. In a time-honoured tradition, camel traders congregate in the desert outside of Pushkar to buy and sell camels, yes, but also to socialize, shop, celebrate, and party. Hindu pilgrims, too, join the throngs to worship on the ghats (steps) of the tiny lake on Karthik Purnima. Pushkar is the site of the only Brahma temple in India, and extremely important to Hindu devotees. And then there are the tourists, who come from all over India and the world to enjoy the spectacle. Along with the camel trading, a mela (fair) has sprung up, complete with competitions, demonstrations, ferris wheels, and a market. In the stadium on the outskirts of town, spectators can watch camel races, moustache competitions, turban tying, and — my personal favourite — the camel decorating contest. Wares for sale at the fair. Photo courtesy of Laura Z. In other words: it’s a madhouse. And it’s particularly tough on tourists because of the intense crowds — and because they are the target for a lot of hawkers who are persistently, and sometimes aggressively, intent on parting tourists from their rupees. Nevertheless, it’s a colourful spectacle, a big slice of Indian culture, and of course an incredible photo op. I recommend going, but keep these tips in mind. This is my top recommendation. Camel traders congregate in the four or five days before the fair begins, and this is when most of the real business — the buying and selling of camels — takes place. This is the best time to wander the tented city that springs up in the desert, camera in hand. The best way to see the Pushkar Camel Fair is with a group. Hotel prices soar during the fair, and the only way to get a good deal is to book with friends. Wares for sale at the fair. Photo courtesy of Swati K.
The single best thing I did while at the Pushkar Camel Fair was hike with a friend up to Savitri Temple, at the top of the larger of the two hills outside of Pushkar, to watch the full moon rise over the town and fairgrounds below. Much to my surprise, we were almost the only people up there. It was a sight I will never forget. Wherever there are tourists, there are scam artists. The most common con at the Pushkar Camel Fair is to charge tourists for having their picture taken. This is annoying but fair — however, you shouldn’t pay more than 10–25 rupees. There are many who will try and charge much more exorbitant amounts. The other most common one is the fake sadhus (holy men) who hang out at the sacred lake, demanding tourists pay about 500 rupees for a puja ceremony, part of which involves tying a red thread around your wrist. One way I’ve gotten out of this scam is to take part in a real puja, and get a real Hindu pandit (priest) to tie a red thread on my wrist. If you try this yourself, when the fake sadhus approach you, hold up your wrist and tell them you’ve already done it. This is one of my favourite things to experience in all of India. It’s very quiet and peaceful, with devotees performing their personal pujas as the early morning glow makes the lake shimmer with sublime beauty. 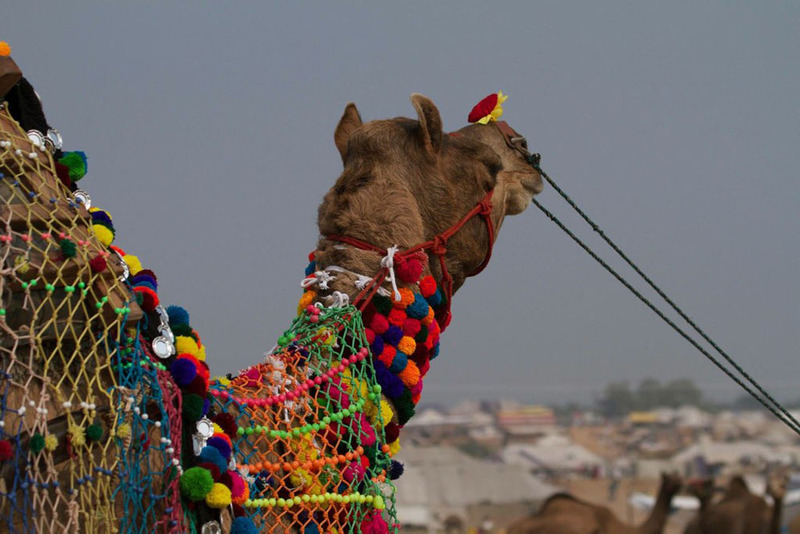 Ready to hit up the Pushkar Camel Fair? We can get you there. 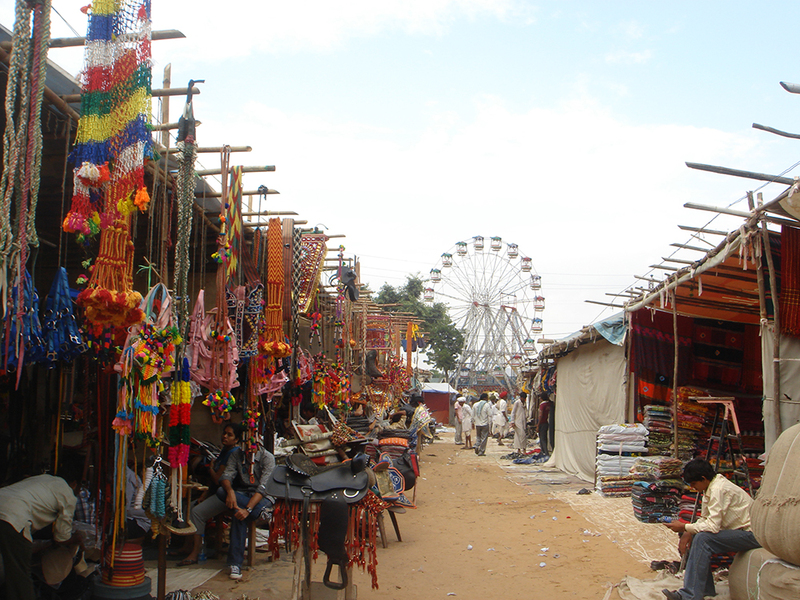 Our Pushkar Camel Fair & Rajasthan trip includes all the action of the fair, plus Delhi, Johdpur and beyond. We're excited to show you more of this big, beautiful world — check out our Pushkar Camel Fair & Rajasthan itinerary here.